This page has a variety of tools to help teachers implement UDL in their classrooms, including lesson plan templates, planning templates, the UDL principles, helpful tips for teachers, and more! 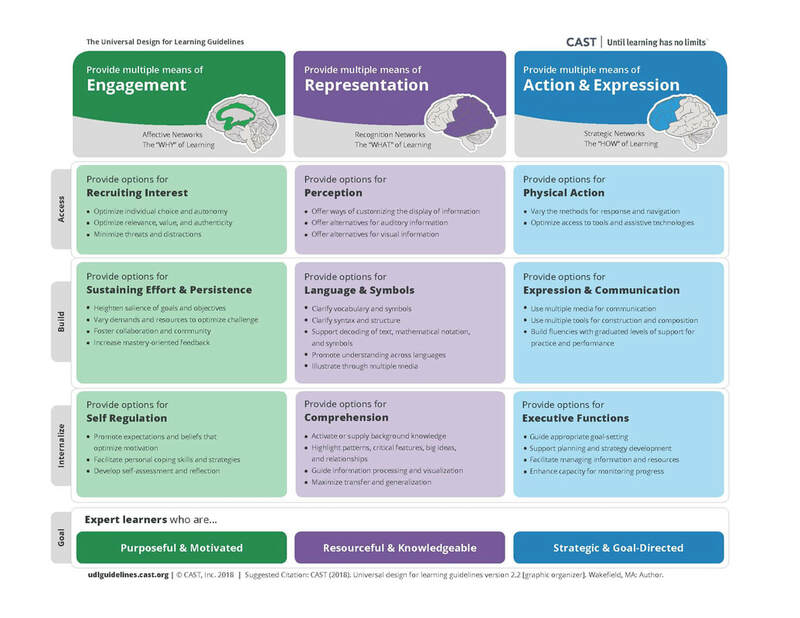 The two files below outline the UDL guidelines by multiple means of representation, multiple means of action & expression, and multiple means of engagement. Knowing the UDL guidelines assists with the planning of lessons that implement the principles of UDL. Both files have the same information, but show it differently. Feel free to use whichever format is best for you. This file is a template that can be used in a classroom teacher's daily planner book. It provides space to write in or type the directions for a lesson in any subject. This template also features helpful checklists for the UDL guidelines, technology, and Multiple Intelligences. This resource can be used in a classroom teacher's daily planner book and is designed to compliment any existing lesson plan. It has checklists for multiple intelligences, technology needed for a lesson, and the UDL guidelines. There is also a space to record any accommodations that you may need to provide to students. I use this resource every day in my classroom. It is really easy. I printed one copy onto cardstock, then put it inside a clear sheet protector so I could write on it with a dry erase marker, then erase it at the end of the day, and write on it again and again. The UDL wheel from CAST features two parts of a wheel that can be easily assembled. It gives teachers concrete examples of how to apply the principles of Universal Design for Learning (examples of providing options for language and symbols include: pre-teaching vocabulary and symbols; presenting information with illustrations, photographs, tables, models, animation, dance/movement, comic strips, etc). This document from Colorado State University has many helpful tips that help bring UDL theory to practice. For each of the guiding principles (multiple means of representation, multiple means of action and expression, and multiple means of engagement), this document outlines objectives, instructional materials, teaching methods, and assessment methods. These tips can be applied to any subject area. This document from UDL-IRN (The Universal Design for Learning Implementation and Research Network) outlines steps that teachers can follow in planning lessons and materials following the principles of Universal Design for Learning. These tips can be applied to any subject area. In classrooms that apply the principles of Universal Design for Learning, students are given the opportunity to learn in a variety of ways through the multiple intelligences. This helps ensure a larger number of students are engaged, and allows them to express their learning in multiple ways. The Multiple Intelligences Matrix is a tool designed to ensure all (or most) intelligences are being included in activities in the planning stage of a lesson or unit. How to Use: Add the activities in the top row. Below each activity, check off which types of intelligences will be addressed by that activity. At a glance, it will be easy to see how many of the multiple intelligences will be included in your lesson/unit! Feel free to check out the Multiple Intelligences Matrix other multiple intelligences resources below. What are my learning strengths? Questions asked at varying levels of complexity makes it possible to include the greatest number of students, and also helps to make the subject matter more engaging for everyone. Bloom's Taxonomy compliments the principles of Universal Design for Learning because it allows students to learn about the same content at varying levels of complexity. Check out this link for lists of iPad apps that support Bloom's Taxonomy.